One of the most delicious home-cooked meals - delicate openwork pancakes. You can eat them with butter, honey or sour cream and stuffed various fillings - vegetables, mushrooms, meat or fruit. Baking pancakes is a time - consuming process, but it will go much faster if you properly knead the dough and learn a few secrets of its preparation. - vegetable oil for frying. 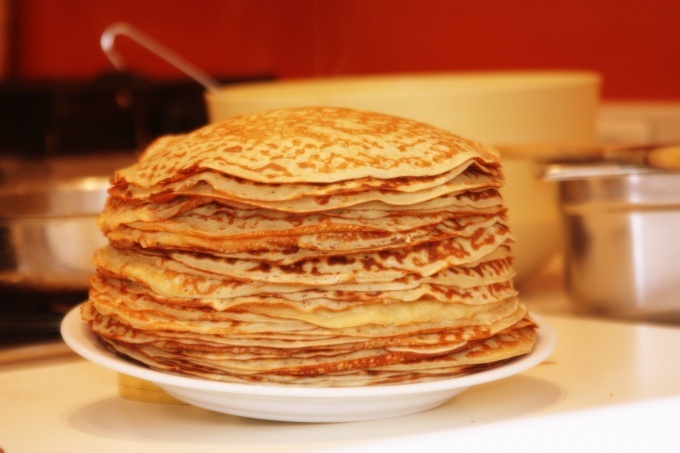 Traditional Russian pancakes are baked from dough with the addition of yeast. The process of their preparation is labor intensive and takes a lot of time. First is preparing the dough, after the dough is infused for at least 3 hours. At home you can cook quicker option - delicate lace pancakes made from unleavened batter. Separate the yolks from the whites and RUB with salt and white sugar. Melt the butter, milk a little warm. Pour the milk and butter in a bowl with eggs and mix well. Portions stir in the flour, carefully rubbing it. Proteins whisk in a lush lather and gently mix to the dough. Grease a heated pan with vegetable oil. Pour portions of the batter, tilting the pan so that it is distributed over the entire surface. Make sure that the pancake is not formed holes. When the pancake is browned on one side, carefully flip it over. The finished product stack stack, promazyvaya cream. Serve pancakes with jam or fresh cream. Baked this recipe products are a delicacy and are perfect for stuffing. Stuff them with sauteed mushrooms, green onion mixture with eggs, or apples with cinnamon. You can pick up a more original toppings - for example, a variety of seafood. Break the eggs into a deep bowl, add salt and sugar. Whisk the mixture until complete dissolution of sugar crystals. Heat the milk and pour it into the mixture, stirring constantly. Add the vegetable oil. Portions and flour, crumbling with a wooden spoon in the dough to avoid lumps. A cast iron skillet grease - it is convenient to use gauze, mounted on the fork. Once again, stir the batter - it should have the consistency of liquid sour cream. A small ladle pour it into the pan, tilting it in different directions to form a round pancake. When the product is covered with bubbles and the edges formed a Golden foil, carefully flip the pancake with a spatula or wide knife. Continue roasting, making sure the pancakes don't burn. Put them in a large flat dish, accurately each with butter. For frying, use only refined vegetable oil without smell.